The United Nations agency mandated to promote and protect press freedom worldwide has named renowned journalist and CNN Chief International Correspondent Christiane Amanpour its Goodwill Ambassador for Freedom of Expression and Journalist Safety. 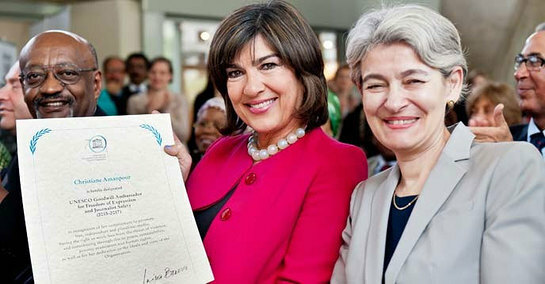 Amanpour received the honour during a ceremony at UN Educational, Scientific and Cultural Organization (UNESCO) headquarters in Paris. “We’re here to make the world a better place” she said. She also made an impassioned plea for the release of all imprisoned journalists, wherever they may be, and condemned the increasing number of attacks and assassinations of media professionals. Ms. Amanpour has won every major television journalism award, including 11 News and Documentary Emmy Awards, four Peabody Awards, two George Polk Awards, three duPont-Columbia Awards and the Courage in Journalism Award. She has also received nine honorary degrees, has been named a Commander in the Most Excellent Order of the British Empire (CBE) and was this year inducted into the Cable Hall of Fame. She is a member of the board of directors of the Committee to Protect Journalists, one of UNESCO’s partners in its work for freedom of expression and journalists’ safety. UNESCO Goodwill Ambassadors are a group of personalities who use their talent and status to help shine a light on the work of the Organization in education, science, culture and communication.